Dark Nights: Metal is the current comic book event miniseries from DC Comics. The series will run for six issues, and will include at least 19 individual tie-in issues. Some tie-ins will be original one-shots and others will be issues of currently ongoing comic book series (such as Teen Titans and Suicide Squad, to name two). Two of the tie-ins have already been published, Dark Days: The Forge and Dark Days: The Casting. The first “Metal” title was published on June 14, 2017 (The Forge) and the final entry in the event (Dark Nights: Metal #6) is scheduled to be published February 14, 2017. Dark Nights: Metal introduces the “Dark Multiverse,” and is written by Scott Snyder and drawn (pencil art) by Greg Capullo, the creative team behind The New 52 relaunch of the Batman ongoing title. The rest of the creative team includes inker Jonathan Glapion; colorist FCO Plascencia; and letterer Steve Wands. Dark Nights: Metal #2 finds the Justice League – Superman, Wonder Woman, Aquaman, Green Lantern (Hal Jordan), Flash, and Cyborg – in hot pursuit of their teammate, Batman. The Dark Knight Detective, however, is determined to address his crisis on his own and to protect his teammates from the really bad thing that is coming to Earth. Thus, conflict is born and the League battles Batman. From the Amazon rain forests to the Valley of the Kings in Egypt, friend fights friend. Can the Batman and Justice League stop what is coming... what may be destined? THE LOWDOWN: I was not enjoying Dark Nights: Metal #2 quite as much as I did the first issue; then, baby Darkseid shows up, and how can I not love that? Then, there is the killer ending and... the arrival. I must say that I find the inclusion of Neil Gaiman's Sandman (Daniel? or Morpheus?) to be contrived, but the other guest cameos (Green Arrow, Gorilla City) are quite nice. Dark Nights: Metal is big, but not bloated, which is what I found Marvel Comics' Secret Empire to be. Secret Empire has so much stuff going on, more than I wanted to follow, so I didn't read it past the zero issue. On the other hand, Metal is so is like a streamlined rocket racing in a straight line past omens and portents to the big, freakin' dark arrival. I think the other thing that is in Metal's favor is that its creative team was The New 52 Batman creative team for the better part of four years. Thus, Metal actually seems like a continuation of something concrete in the DC Universe, something will not be re-birthed and rebooted away – Snyder and Capullo's Batman. Metal validates that Batman comic book series, and Batman is the anchor for this big event which might mean something important to the DCU for some time to come. 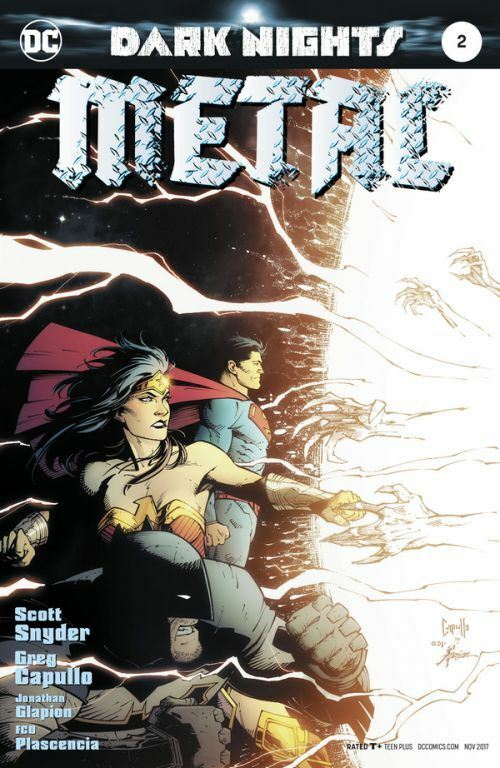 I READS YOU RECOMMENDS: Fans of Scott Snyder and Greg Capullo's Batman will want to read Dark Nights: Metal.